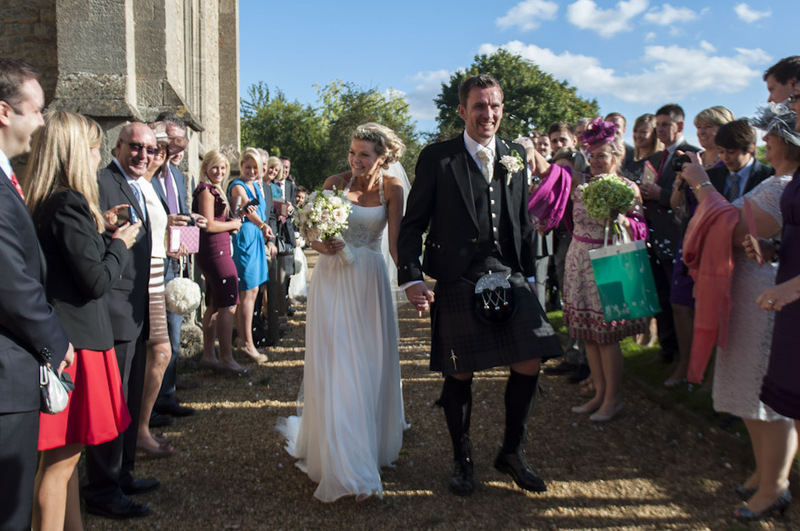 Tarli & Richard brought their two families together at their wedding, mixing Richard’s Scottish background with Tarli’s childhood, marrying in St. Kyneburgha’s church in rural Castor, near Peterborough, where Tarli grew up. Richard and his groomsmen started the morning in luxury, having drinks at The George Hotel in Stamford. Tarli got ready at her parents’ home in Castor, in what was the Old Smithy hundreds of years ago. Her dress was a beautiful, flowing grecian dress, and coupled with her stylish up-do she looked stunning. Richard stayed at The William Cecil in Stamford, and had drinks with his groomsmen in the ancient George Hotel. As a Scotsman, Richard wore his tartan kilt, although the colours were black and grey to fit in with the colour scheme of the day! St. Kyneburgha’s church in Castor is famed for the angels adorning its ceiling. The guests sang a song from Tarli’s primary school which made everyone smile. Not to mention the couple’s gorgeous daughter as their flowergirl. Tarli’s parents’ garden was transformed into a beautiful marquee wedding reception, which suited my style of natural wedding photography perfectly. In the evening a fish and chip van served the guests after a brilliant Ceilidh dance. Absolutely beautiful photo’s! THE most stunning bride, and you have truly captured the magic of the day.